Konet Review 2019: Is Konet a Good Hosting? Konet is a Greek web hosting provider with a long history but very modern hosting products utilizing the latest hardware and software. They provide customers with a great value-for-money range of web hosting and VPS solutions. Konet is based in Thessaloniki, Greece, and has been in the business of providing web hosting services since 1999. Unlike many other early hosting companies, they have moved with the times to provide a very contemporary hosting service. While Konet’s language of business is Greek, their generously resourced web hosting and VPS solutions are delivered from data centers located in Frankfurt, Amsterdam, London, and Washington, D.C.
Konet goes all out when it comes to providing their customers with the best features in their hosting packages. Even their web hosting has semi-dedicated resources, with impressive hardware comprising SSD storage (with RAID 10 redundancy), DDR4 RAM, and 1 GB ports. Their software offerings are equally impressive with CloudLinux OS, LightSpeed Web Server and Cache, and a professional anti-spam filter. Customers with mission-critical requirements can benefit from the VIP support and additional resources offered by the Business Hosting. At the other end of the scale, the Managed WordPress plan allows you to host a website using the most popular CMS without worrying about the admin. A simple slider allows you to choose your VPS resources, there are multiple data centers around the world to choose from, and the complete Imunify360 security suite – with malware detection and advanced firewall – is preinstalled to protect your solution. There is also 24/7 DDoS protection for all plans. Although Konet’s prices are ostensibly not the cheapest, they look like good value for money when you consider how their features compare with other providers. For one thing, all hosting except for VPS hosting is backed by a 30-day money-back guarantee. Secondly, there are no bandwidth limits, and the other resources are also quite generous. They also provide (for free) the kind of software you would usually pay for, including Imunify360 security and an SSL certificate. All web hosting and managed WordPress hosting comes with the same basic packages and pricing structure, with the fully managed WordPress hosting obviously costing a bit more. The Business Hosting packages are very affordable for enterprise-level web hosting. It’s somewhat surprising that domain registration is not included in the prices, but they do provide DNS management for free in the first two years. Oh, and did I mention their 99.99% uptime SLA? Konet offers 24/7/365 technical customer support primarily via a live ticket system, but you can also reach out to them via live chat and telephone (during office hours). Their technical support staff are responsive and very good at solving most issues, and you can also purchase additional levels of support services up to a semi-managed level. While nowhere near comprehensive, their knowledge base is well organized and has articles about the most important aspects of hosting. “Value for money” is the phrase that immediately springs to mind when describing Konet. 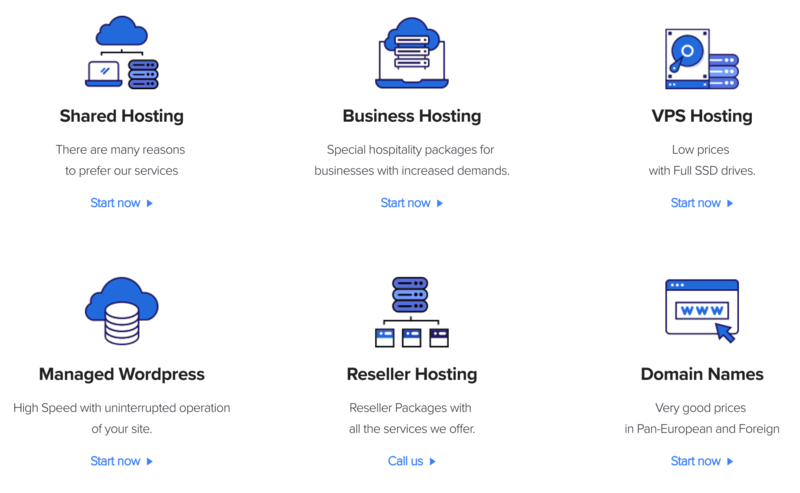 They are probably best suited to business hosting solutions at all scales, but even individuals can benefit from their surprisingly powerful and affordable hosting services. Wondering how Konet stacks up against other Web Hosting companies? Enter any other Web Hosting company and we will give you a side-by-side comparison.